(Reuters) - Missouri Governor Eric Greitens, already facing an invasion-of-privacy trial next month stemming from an extramarital affair, was charged separately on Friday with felony computer data tampering, prosecutors said. 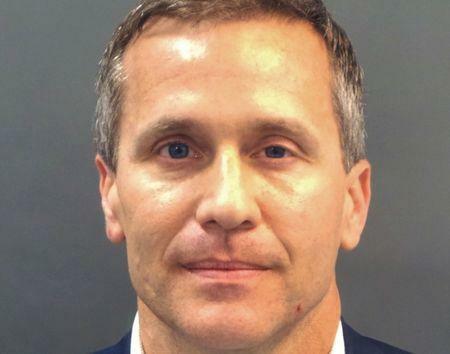 The new case, referred to prosecutors by Missouri's attorney general, was filed by St. Louis Circuit Attorney Kim Gardner, according to her office, which also brought the privacy charge against Greitens in February. The criminal complaint in the computer tampering case, a copy of which was furnished by prosecutors, said the alleged computer offense occurred in April 2015. Missouri Attorney General, Josh Hawley, told reporters on Tuesday his office had uncovered evidence of the electronic theft by Greitens during a broader investigation of a combat veterans charity founded by Greitens, a former U.S. Navy SEALs commando. The criminal complaint and accompanying "probable cause" statement accuse Greitens of felony computer tampering to obtain and transmit the donor list of the charity, The Mission Continues, for his own gain without its permission. Greitens called the accusations "ridiculous" when they were outlined earlier this week by Hawley. The governor's attorney, Jim Martin, described them as "false allegations." The governor, a first-term Republican, has come under mounting pressure from Missouri politicians of both parties to resign since he was charged in an unrelated investigation with criminal invasion of privacy. He was accused in that case of taking a compromising photo of a woman with whom he was involved without her consent and threatening to use it as blackmail. Both the invasion of privacy and computer tampering charges of felonies, each punishable by up to four years in prison. Greitens, 44, a married father of two has acknowledged having a months-long affair with the woman but has denied any criminal wrongdoing, asserting that he is the victim of a political witch hunt.